Our families are the roots from which we grow. Although we all blossom in different ways, we can find support in our lineage. 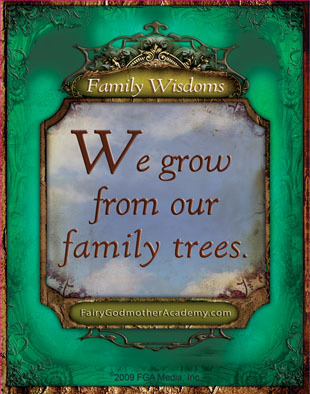 Interview a family member and discover your family’s wisdom! Who will you interview? Mom? Grandma? An aunt or cousin? Someone else? Remember, you can always interview another family member later! Ask about who she admires, her fave green world memory, where she finds wisdom—or just get a funny story. Try these questions or make up your own! Who is the woman you most admire? What is your favorite memory of the green world? When you were my age, what was your life’s dream? What has been the best surprise about how your life turned out? Great, you’re on your way to discovering your family’s wisdom! When you go on the interview, bring your computer or a notebook with you. Write down the questions you came up with and the answers you get. Step 4: Tell Birdie about it! Birdie can’t wait to hear about your family’s wisdom! Who did you interview? What did you ask her? Birdie will feature her favorite family wisdoms from Academy Founders on her blog, so send her a message. i cant wait to try it too grace! I have too try this! I have to try this too. where do you enter your code on the wisdom card? Or is that not possible anymore…..
i never thought that interviewing could be so fun! This seems cool, but I don’t get how you decide what’s your family wisdom. Me too! This sounds awesome!! I can’t wait to interview my……..Grandma, Mamaw, Nana,and Mom? They are the people I look up to the most! I don’t know what I would do without them! I cannot wait to interview my mom! I don’t know… can you inter view yourslef? I’m so going to. I’m asking people I know to write down their wisdoms. Who is the woman you most admire? My Nanay (Mother), because she has done so much for me and taught all her great wisdom. What is your favorite memory of the green world? I don’t remember the green world, for our family is a part of it. Remember when we use it’s children for healing? Well, when we do that, remember you should always thank the plant and the mother for helping us. Where do you find wisdom? Everywhere. From healing plants, the voice of the wind, the gentle glow of the moon, and the great sparkle of the stars. You will find wisdom everywhere you go. When you were my age, what was your life’s dream? I didn’t dream of a great future. I just worked all day for years, with the help of gifts given to us by the Great One. Now, I have finally found rest from all the work when I was a child. That time I went to school all the way from Santa Monica, to Magsaysay!! All the while I was carrying a sack of kamote (sweet potato). It was good to have the company of Ingko (brother). You mentioned that you overcame your hardships through gifts. What kind of gifts? Your sister has mastered the gift of showing beauty as it truly is. One day you shall too. But our family most sacred gift, is the art of healing. My grandmother, your great-great grandmother, was the best healer on the island. I hope that our gifts have come down to you, if you choose. Lola, Tia has said that the Enchanted Ones have a different tongue as we. Can you give me some examples of their language? It is true child. The beings not of us speak differently. Their Nanay is sinaligan, Tatay(father) is gidaitan. And the flower of both is binuwakan. Which is you. Long,long time ago there was a greedy keeboy (youngest child in the family) who was chubby and plump. This is because he steals the food of his six sisters and six brothers. Yes I know. One day his Nanay sent him to trade cloth for delicious fruit. He went and bartered with the old man for fruit, and rudely went away. His mouth watered of the many colorful various fruits. Then his best friend came and asked for some fruit. But the greedy on dint give. Soon, more and more of his friends went to asked for fruit. Then, he hid under the charcoal, and at once became covered with soot and became the horrible crow. THE END. Now, please peel the cacao seeds. We will make tablia soon!! O.K., so how do you know when you’re a fairy godmother? Do you have to be a certain age to become a fairy godmother and then teach fairy-godmothers-in-training? What if I’m making most of these stuff for relatives…do I still get the Wisdom card? PLEASE answer my question! I need to know. And answer whenever you are able, I come on here quite regularly. OK, así que ¿cómo sabes cuando eres un hada madrina? ¿Tiene que tener cierta edad para convertirse en un hada madrina y luego enseñar hadas madrinas en formación? ¿Qué si estoy haciendo la mayor parte de la materia de tesis para los familiares … qué más me da la tarjeta de la sabiduría? Por favor, responda a mi pregunta! Necesito saber. Y contestar Siempre que le sea posible, vengo aquí con bastante regularidad. POR FAVOR, POR FAVOR, POR FAVOR RESPONDA! OK, alors comment savez-vous quand vous êtes une fée? Avez-vous d’avoir un certain âge pour devenir une fée marraine, puis enseigner fée marraines en formation? Que faire si je fais la plupart de thèse trucs pour les parents … ai-je toujours la carte de la sagesse? S’IL VOUS PLAÎT répondre à ma question! J’ai besoin de savoir. Et répondre à chaque fois que vous êtes en mesure, je viens ici assez régulièrement. S’IL VOUS PLAÎT, S’IL VOUS PLAÎT, S’IL VOUS PLAÎT réponse! I don’t care if you answer in a different language, I’ll translate. Need help!!! Amira, when you are a fairy godmother you KNOW it, you don’t know how all of the time but you know. And yes if all this stuff is for relatives then it counts. Last of all when you become a fairy godmother your job is to help others become them, you also have to finally give a sigh of relief that what you were working for your whole life is completed and now as a fairy godmother you can watch tv all DAY! But if you don’t want to watch tv all DAY, then you can do some activitys that help the environment or the community. But my question is WHY? Why become a fairy godmother in the first place? What is the point? Why not just do fairy godmother stuff without being one? Any way if you want fun activitys I may post some. WAIT! Before you go I want to give you a message to translate! Its FRENCH! Allez au parc et trouver la fleur pourpre. Ensuite, prendre avec vous à la rivière la plus proche et le déposer dans! Pour ce faire, chaque fois dans un tout.Voici plus! Allez sur lds.org et naviguer autour, son impressionnant! Je pense que vous allez l’aimer, si vous ne dites à vos amis qui venaient! Gee thanks Nancy! I’ve been waiting for someone to reply for like EVER. I translated it and OK, I will do that. I also checked out the website. Kool! I liked it. 🙂 I will share it with my friends. I don’t think I will be sitting down and watching TV, lol. Sure, I’d love if you could post projects to do. I’m always ready for more things to do! 😀 And I hope it will be OK if I can put it on my blog! (I can give you my blog address) . i might do this on this mom but i don’t know what to ask her does anyone have good questions? 1. What the craziest thing that ever happened to you? 2. Do you like the green world? 4. What was your dream job when you were little? 1.”I admire any (young) lady with grace, beauty and responsibility. 2.My fave memory was when I was young and my school principal made my idea of making a new slide with designs from every class as a project. 3.What is your fave color? :My favorite color is lilac because it reminds me of my mother. 4.What is your dream job? :My dream job is to be a paramedic. When I read through this, I realized with surprise – and yes, also some sadness – that I myself am now the oldest surviving member of my entire family. I am so, so glad I did ask my parents, grandparents, aunts and uncles lots of questions. Not these questions, but others, and some were a bit like these questions. And all of you who are reading this page, you will be so glad, all of your life, that you asked your elders these kinds of questions. Their answers will be a gift you can treasure for the rest of your life, and pass on to your own children.